Chrissy Pk. The Spruce Crafts, 2016. Learn how to make a closed origami cube gift box! 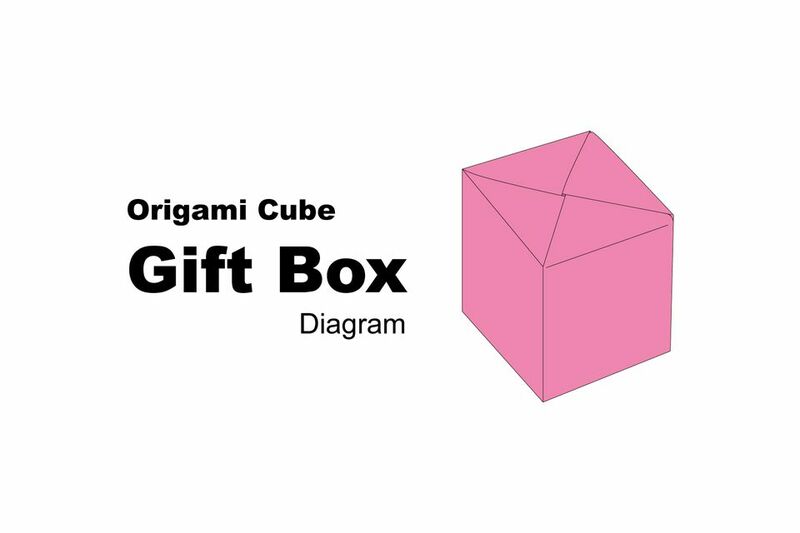 This intermediate origami model can be learned with either a diagram or video, use this box to gift wrap or make little origami blocks. We used green and brown paper to make them look like mine craft blocks! You could also use white paper and draw the other types of blocks used in the game if you wanted to! This origami cube is intermediate level, so you'll need a bit of origami experience to fold it. If you have any trouble, there is a video tutorial linked at the end of the step by step. Once you have folded one, however, you quickly get the hang of it, and you can make a cube pretty quickly. These cubes are used in the Origami Tic-tac-toe game, which can be found here. Start white side up if you have one. Make a pinch in the center by folding the top to the bottom and pinching in just the middle. Make another pinch in the center by folding the left to the right and pinching. Now fold all of the four corners into the middle, using the previous pinch marks as a guide. You should now have a smaller square as shown. Now we'll be folding the square into thirds, making 9 equal sections. Then you can make a mark at 4cm in from the left on the top edge. For an in-depth article on how to get thirds, click here. Continue to fold the thirds by folding the right edge over to the mark on the left. Then fold the left edge to the new crease. Now fold the bottom edge up to where the diagonal line meets the previous creases. Fold the top edge down to where the lower diagonal lines meet the previous creases. Fold the paper diagonally in half, creasing only where indicated, missing the center square. Fold the paper in half in the other direction, again missing the center square. Flip the paper back over to the other side. Make sure the paper is as shown. You will see a diagonal grid. Fold and unfold the bottom edge up to the top of the diamond-shaped creases that are indicated by the red dots. Repeat the last step on the other three sides, rotate the paper to make it easier. Fold all four of the corner flaps inwards. Re-inforce the valley folds that are indicated. Start with the top, folding the paper diagonally over to the right and creasing. Then rotate the paper to make it easier. Reinforce the orange lines as mountain folds by lifting the paper and creasing along those lines. Look at the model in the next step to see how the paper needs to be folded. Start at the top, folding the top mountain fold forward and to the right, while folding the top left section down. Fold the top right section over to the left, so that all the points that have a blue dot are touching. Look to the next step to see where the paper needs to end up. Now you should be able to fold the next section, the lower right section up and over to overlap the previous one, and continue with the others. Fold the point indicated as 1 down, followed by 2, 3 and 4. Pont 4 is to be tucked inside the flap. If you had any trouble following this diagram, check out the video tutorial here. The tricky part is at 6:00 in the video. We hope you enjoyed making this origami cube gift box, if it was too tricky for you, try a simpler model first, such as the traditional origami masu box, or slightly harder, the origami open box.